The Mi’kmaq, the First Peoples of Nova Scotia, are important contributors to the historical and cultural identity of the province. The First Peoples Resource Box helps students understand the traditions, technology and lifestyle of the Mi’kmaq, and their unique relationship with the environment. 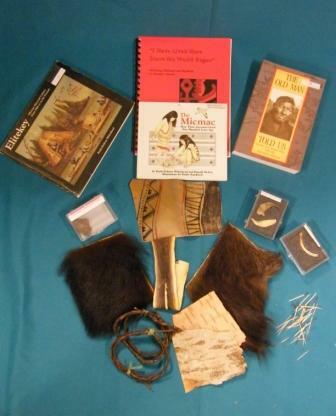 The box contains hand-on samples such as birchbark, sweet grass, porcupine quills, stone tools, and eel skin, as well as books, posters and tracings of Mi’kmaq petroglyphs. Outcome 2: Students will examine the origins of diverse peoples in their province and their expression of culture, including Acadians, African Nova Scotians, Gaels, Mi’kmaq, including treaty education, and additional cultural groups. Formulate questions and generate ideas for research and inquiry about diverse peoples and cultures in the province. Deduct ideas and synthesize facts from sources about peoples and cultures in the province.